Πατήστε τη φωτογραφία και δείτε όλες τις φωτογραφίες του Apartment Balchik Zahari Zograf st II. Διαθέσιμο WiFi σε όλους τους χώρους, WiFi με χρέωση, Εξωτερική πισίνα, Κλιματισμός. Boasting sea views, Apartment Balchik Zahari Zograf st II is located in Balchik, 2.9 km from The Palace of Queen Maria. The property is 3 km from Botanic Garden Balchik. This apartment is fitted with 3 bedrooms, a TV, and a kitchen with a dishwasher and an oven. 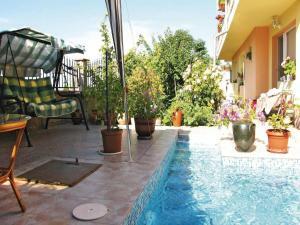 The nearest airport is Varna Airport, 49 km from the property. Outdoor pool on site is shared with other guests and opening times apply as follows: June - end August Please note that the full amount of the reservation is due before arrival. NOVASOL will send a confirmation with detailed payment information. After full payment is taken, the property's details, including the address and where to collect keys, will be emailed to you. A security deposit of EUR 100 is required upon arrival for incidentals. This deposit is fully refundable upon check-out and subject to a damage inspection of the accommodation.